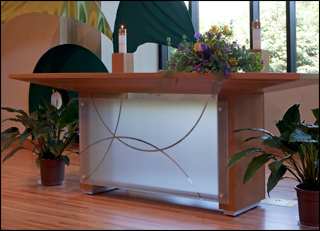 Chancel Furniture That Adds Subtle Style And Beauty To Your Church. 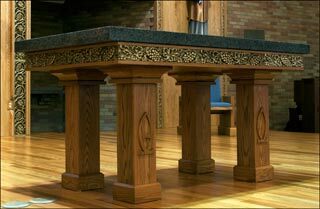 For over seven decades, Ratigan-Schottler craftsmen have artfully constructed chancel furniture. Each piece of furniture is designed and crafted with skill and care. Though fashioned with an artful touch, all of our products are created to be durable and to last for generations to come. We make each product unique according to the atmosphere of the church we're creating it for. Many of our designs incorporate the combination of multiple wood species, glass, stone, marble, bronze, brass, aluminum and stainless steel. Northern-grown solid red oak is our standard wood of choice for church furnishings. However, other wood options are available at your request. We hand-inspect all the wood to ensure that it's of the highest quality possible. To find out more about our services or to receive a product catalog, we welcome you to contact us at 800-383-1000. One of our experienced agents will be happy to assist you and answer any questions that you may have. Please ask us about pew refinishing and restoration services. 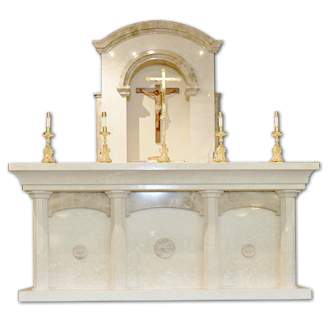 Imported Italian Marble Altar, Ambo and Reredos. 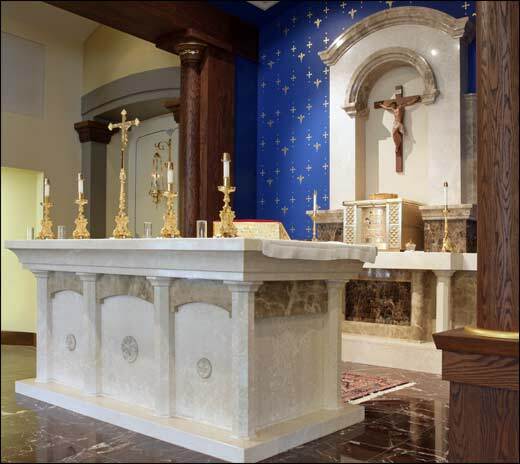 Holy Trinity Catholic Curch, Westminster, CO.
Not only do we provide a complete line of standard chancel furniture, we offer complete design services, including stained glass, church lighting, statuary, and church art work. 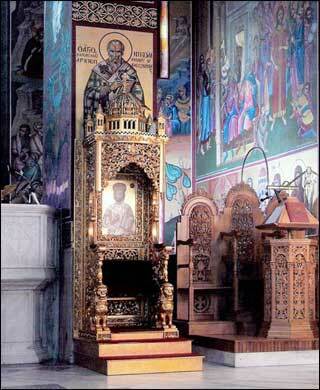 We have been commissioned to produce this Bishop's Chair for a Orthodox Cathedral located in Sumter, SC. Custom intricate work like this is not only our specialty, but our passion! Custom altar with etched glass and brushed aluminum accents. 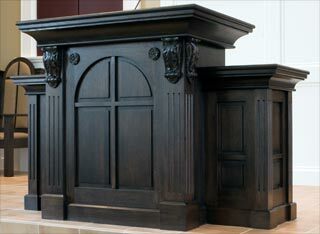 Custom wing pulpit with hand carved corbels. Custom altar with hand-carved grape and vine molding with gold leaf accent.